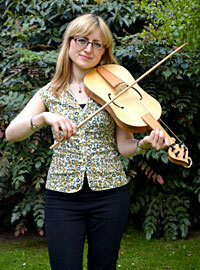 mily Askew is a versatile musician playing recorders, vielle (medieval fiddle), bagpipes, fiddle and piano. Her interests are wide and varied reaching from the deep roots of folk music through to Medieval, Baroque and contemporary repertoire. She has recently released, Alchemy, her debut CD with The Emily Askew Band, which has received rave reviews across the folk and national press. "One of the albums of the year **** "
"Mixing folk and early music with beauty and precision **** "
...a real creative vision...excellent musical skills...an artist to look out for. Clare Norburn, Brighton Early Music Festival.